Dryer care is a necessary part of a commercial laundry’s daily operation process. HELLO! Those of you that have read our blogs here at LES know that we like to throw fun facts and history lessons into our articles. Last month we talked about washer maintenance and managed to teach you about Henry Ford in the process. But what are we going to learn about this month? We thought we’d go with dryers and how to maintain them…and we’re going to go back in history even FARTHER than Henry Ford! Now think about the dryer/dryers that you own or operate-they aren’t such wonderful inventions if they aren’t actually working. Is your laundry damp or musty after it finishes a complete cycle? Is it taking forever for a load to finish drying? Does your dryer feel hot to the touch – or maybe it has even stopped working completely? If you answered YES to any of these questions then you most likely have a lack of proper dryer care processes in place and now you have a major lint problem. Performing preventive maintenance on your machines and ductwork will get rid of the lint and getting rid of the lint will keep it from slowing down your machines. More efficient machines mean more money in your pocket at the end of the day! We talked about washer maintenance last month and we broke the HUGE job down into smaller jobs spread out over the course of an entire year. We’ll help you with your dryer also – by making the job more manageable! LINT – clean out your lint screens and compartments AND get rid of lint around the outsides of the machines as well. SURFACE – wipe the outside of your machines with mild detergent and clean water. LUBRICATE – larger dryer models (120, 170 and 200 lb.) need fan AND trunnion bearings lubricated every 200 hours. REMINDER! Did you remove any screens or access covers? 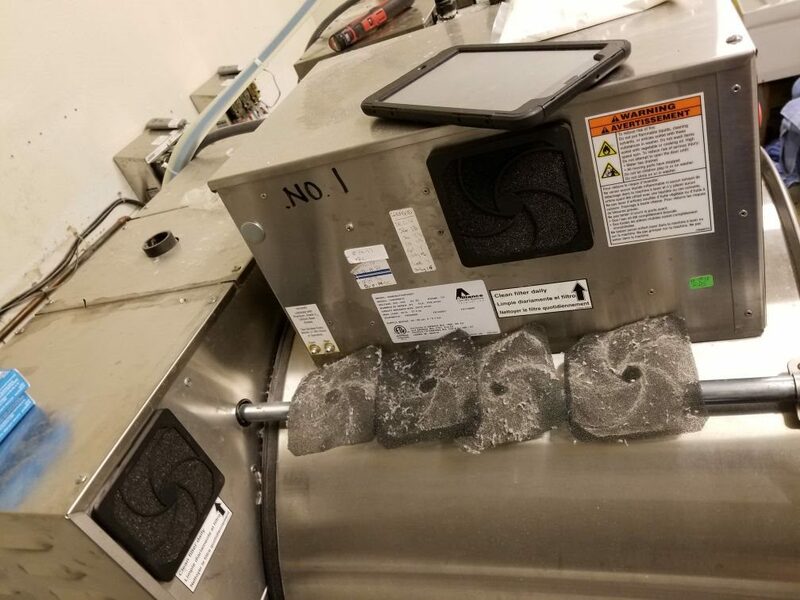 Make sure to replace them before putting your machine back to work! How is everything going so far? Are your machines sounding and working better? Just imagine all the work we could save ourselves if Mr. Pochon’s ventilator was still in use! Notice that we keep mentioning lint – over and over and over? That “ventilator” would have burnt the lint off as it was formed – very convenient! LINT – find the air vents on your motors and vacuum them clean. Also, if your dryer models have steam coils or a rear thermostat, clean the lint from them as well. BELTS – refer to your owner’s manual for locations. Check the tension and condition of each belt. If they show wear or are cracked – replace immediately. FIRE – does your machine have fire suppression? Go to the control box and press the test button. 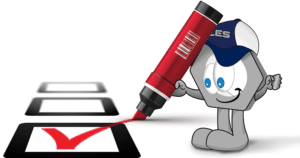 Your owner’s manual will have full and detailed instructions on how to perform the test. LINT – remove front panels and vacuum. Also, vacuum the lint from the coin mechanisms AND from the burner tubes and the orifice. NUTS AND BOLTS – examine all mounting hardware and tighten loose bolts, nuts and screws. GAS AND STEAM – check all the machine’s gas and steam connections for any leaks or loose parts. Also – while you’re there check your steam filter and REPLACE it if dirty. FIRE – check the hoses on your fire suppression system. They should be replaced every 5 years but if they are showing wear or have cracks: replace them now. There – a year worth of work in nice, manageable jobs for you! We can hear that extra money jingling in your pockets right now! Be sure to download our Dryer PM Guide, and also print and laminate our dryer checklist to help your laundry staff get it all done. If you want to learn more about washer and dryer service be sure to join us for one of our service schools. If you decide you don’t want to go through that list again – and would rather use that extra money to give you extra time then give us a call! We can get that list done for you – whenever it fits your schedule the best! Panati, Charles. Panati’s Extraordinary Origins of Everyday Things. Book Sales, 1989.